working too hard while believing in yourself? The Bible says in Ephesians 2:8-9 "For by grace are ye saved through faith; and that not of yourselves: it is the gift of God: not of works, lest any man should boast." 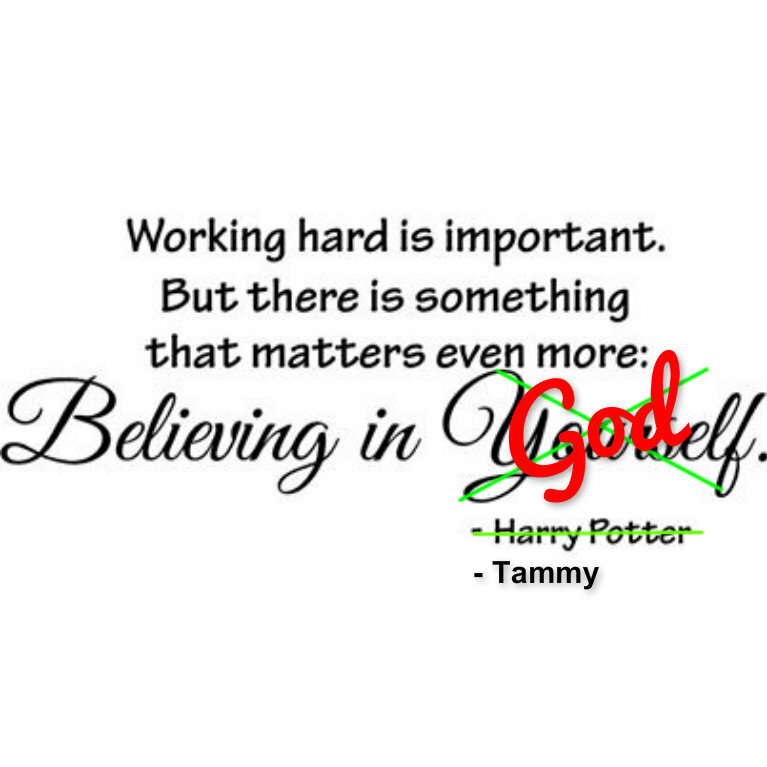 Are you working hard at being a Christian? I don't mind hard work. I don't like people to rework what I've finished! Do you? Salvation is a gift of God. We cannot work hard enough to obtain it. We can't believe in ourselves enough to reach it. If we could work it out, the scriptures say we would just brag about it (true story). Jesus finished his work on the cross. He doesn't need us to rework his plan. It's already perfect. We can't do enough good work to make us a Christian. Saving grace happens when you believe in Jesus with your whole heart without any "work" on your part. Christ died for our sins. His ultimate work is the only thing that satisfies God. I like Harry Potter! I hope you didn't gasp and delete my email when you read that. Harry stands for good in the wizarding world. He was their salvation just like Christ is ours. 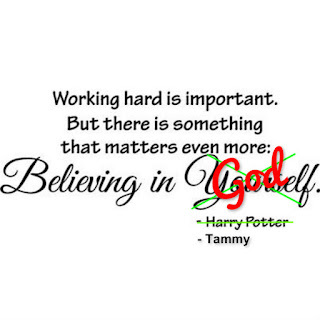 But, there is a vast difference between Harry Potter and Jesus. Harry Potter is fiction. Jesus is real! I take a middle of the road approach - trust God and work hard! I believe that pray without work doesn't amount to much. God has blessed us with resources and gifts for us to utilize. There is a blessing in what He's given us to help us work towards our goes. There is a miracle in HIM working it out for us when we've done no work at all. Andrea @ be-quoted.com visiting from SITS. Thanks for stopping by! I totally agree with you as you said "There is a miracle in HIM working it out for us when we've done no work at all!" He did it all for us!! !